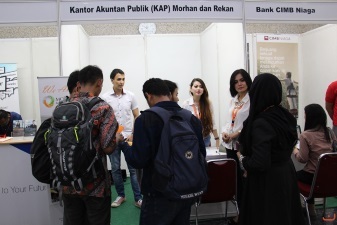 Perbanas Institute through its Career Centre hosted its annual Job Fair on 29th – 30th May 2015 providing its newest alumni members and recent graduates with the opportunity to initiate a professional career with leading banks and respected companies in finance. The institute’s rector, Prof. Dr. Ir. Marsudi Wahyu Kisworo, opened the event with a speech encouraging attendees to take advantage of the Job Fair and followed these keynote remarks with a certification handover to recruiters including Bank BCA, Citibank, Bank CIMB Niaga, Bussan Auto Finance, and Valbury. This year’s career fair was held one day after Perbanas Institute’s graduation ceremony presenting fresh graduates with a head-start in an increasingly competitive job market as well as offering the chance to enrol in Perbanas’ Postgraduate School for individuals interested in pursuing the next level of tertiary education. Perbanas Institute also opened the event to the public while waiving entrance fees often associated with such functions. The two-day event was attended by hundreds of eager students, and thus served as the ideal recruitment platform for esteemed financial firms relying on Perbanas Institute to supply their respective companies with skilled human resources. Perbanas Institute’s Career Centre’s repeated success in carrying out this type of activity has opened the possibility for more frequent job fairs in the coming years provisionally inviting additional numbers of participating companies according to Head of Perbanas Cooperation Office, Mr Adi Darmawan, S.H., M.H. Perbanas continues to uphold its responsibility to assist alumni in kick-starting their careers through an unmatched network of industry partners to accelerate every graduates’ journey of becoming key players and pioneers in finance and banking.